I appreciate seeing photos of people and the layout. They give me a greater sense of the size of things and the relationship of the layout to the room space. Sounds like everyone had a great time. 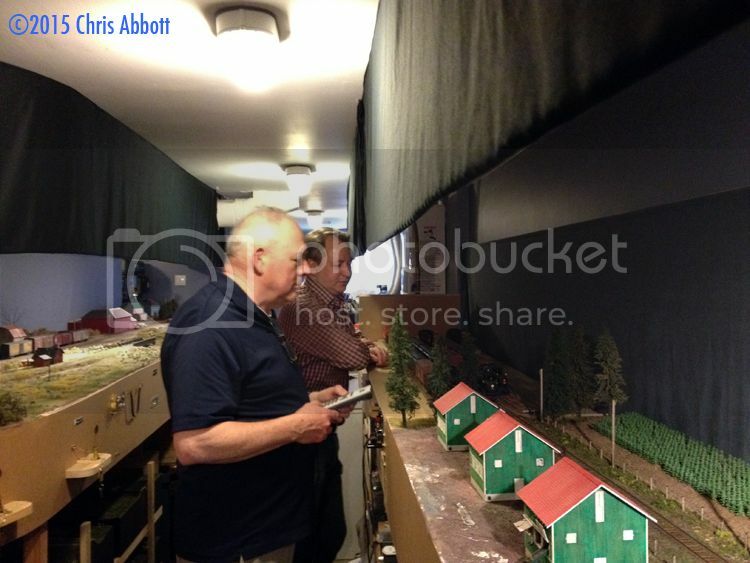 My God man you realize the importance of a pub and a pint and you DO NOT have armrests along the entire edge of the layout?!?!?! While you’re joking, I’ve certainly thought about it. The problem is, my main aisle (running between the sector plate and Port Rowan) is already pretty narrow. People must already turn sideways (to face the layout) to pass each other – which is fine, because they tend to be facing the layout anyway. Adding a leaning rail would make it really tight for two people to pass. In the wider aisle space through the Lynn Valley area, the fascia is mostly curved – and foot-tall wire-armature trees come right up to the front edge of the layout so there’s no worry about people leaning. I should add that I have not had any problems – zero – with people leaning on the layout. Three dimensional scenery tends to do that – and the combination of static grass plus tall meadow plants comes across as very three dimensional even on “flat” areas of the layout, in contrast to ground foam, which is flat enough that people will put a hand on it. The only place people lean is on the flat base on which the sector plate rides – and I’m okay with that. Michel has lots of prototype expertise switching as for several years he was a conductor on the Hull, Chelsea, Wakefield, steam tourist railway, running over CP’s former Maniwaki Subdivision. Funny, I worked there as a fireman and all the time, he would be doing the signalling while I was between the cars hooking up the turnbuckle couplings and attaching the air hoses and related parephanelia. Something about not getting his uniform dirty! You’re not the first to wonder about the layout height. The railhead is 48″ above the floor, and the reason for that is detailed in this blog post. I haven’t generally posted photos of the layout in the room because it’s difficult to light and photograph properly: I’ve put the light on the layout, and left the aisles generally dark – like a museum exhibit. I certainly had a good time. No better way to spend a vacation day than to get trains, friends, and food involved. Great to finally meet Michel in person! His real-life experience has modified my way of thinking about certain train moves (I’ll probably still make mistakes, though). I have been wondering for some time if you know of other modelers who are building their version of Port Rowan in S or another scale. Your simple concept that seems to yields a great deal of enjoyment has influenced many I suspect. My approach to designing and building a layout was changed as I started to follow your Blog. Great question, Gene – thanks for asking. Before he passed on, my friend Richard Chrysler was building a version in HO as an exhibition layout. 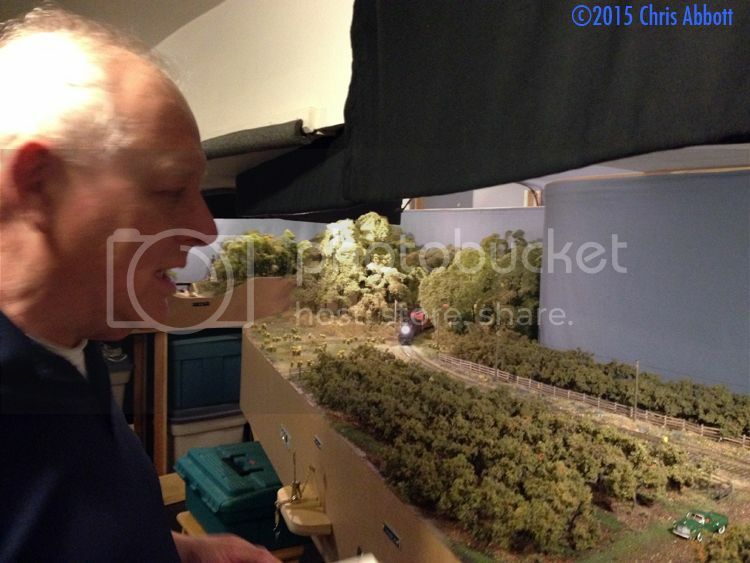 There’s a photo of him working on the layout in my blog post about his passing. I do have friends in the S Scale Workshop who are building other portions of the Simcoe Subdivision. Jim Martin has built Port Dover – the other end of the subdivision. He used to bring it to exhibitions, but it’s now been retired from the show circuit and is used as the terminal on his home layout. 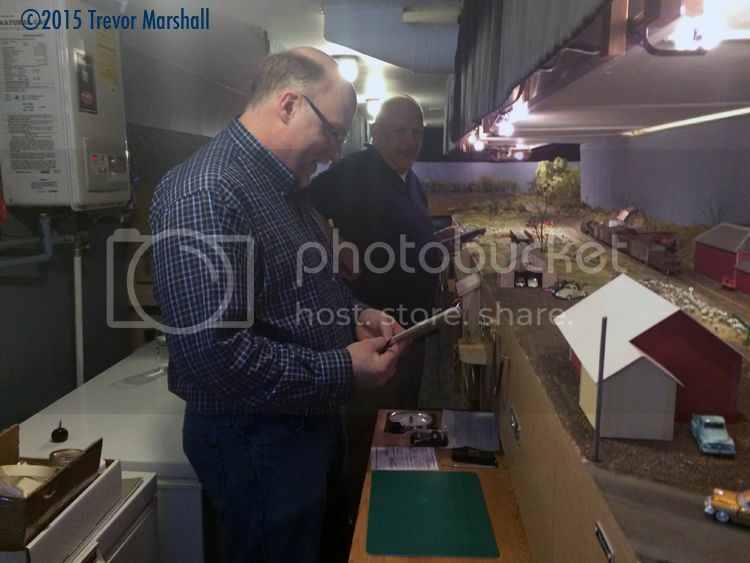 Meantime, David Clubine is planning his S scale layout, which will feature Simcoe as its main yard. Simcoe is the junction for the two branches to Port Rowan and Port Dover (which together form the Simcoe Sub). I know that he plans to have both branches active, but I’m not sure if they will end up in staging or in one or two modelled terminals. I managed to start Port Rowan in my previous home about 6 or 7 years ago in S. It was part of a very much under planned over ambitious layout. I got Port Rowan to the point of running, then we started to look for a farm to relocate our business and home, and it all came down.